Josiah in the middle of the large kids field. 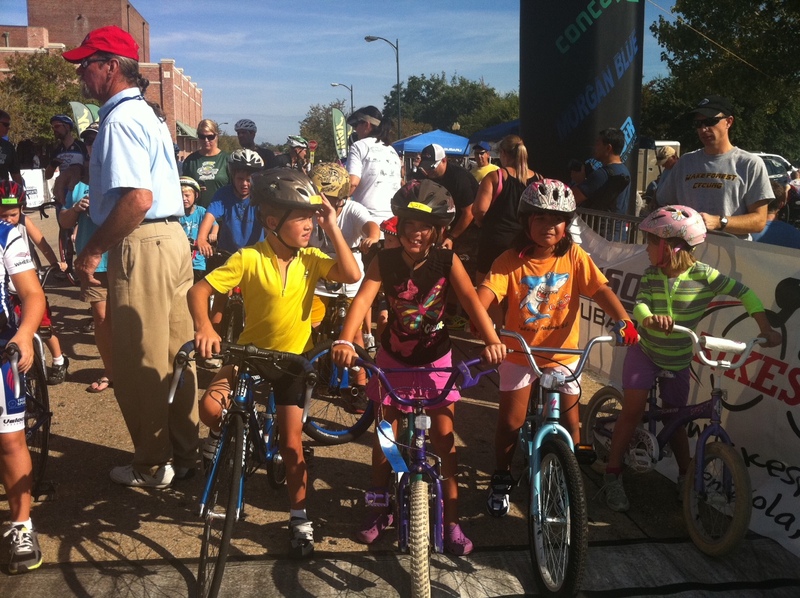 I’m talking to the promoter in the background about ideas to encourage racers to register earlier for the race — getting ready to follow behind the kids who were very excited to do an entire lap of the course! Analise in the pink skirt had a front row starting position and rode well on a bike that is too small for her. One of many unsuccessful attacks – this is heading into the course’s one lefthand turn. Quick summary – 14th in the criterium after botched field sprint, but held on for 5th overall in the stage race. Up ahead in the six-man break, Frank Travieso (Team Coco’s) won a very tight sprint ahead of Michael McBrien (Subaru) in 2nd, whose twin brother Gene would win the Cat 3 race immediately following our Pro/1/2 race, David Gutenplan (UHC/706) in 3rd, and Shawn Gravois (Globalbike) in 4th. Ryan Saylor (Gearlink) and one other rider also were in the break, so the field sprint was for 7th place. The details – the forecasted rain stayed away, so instead it was hot and humid for this one hour criterium. After a really poor time trial yesterday, I was in a distant 5th about 45 seconds back from Stephan Hirsch (UHC/706) in 3rd and Jan Kolar (HomeSmart/L5Flyers) about 15 seconds in front of me in 4th. I had a relatively safe cushion of 45 seconds in front of Jonathan Bowerman who had come off our break in the road race and finished about a minute and a half behind us. But Jonathan had a smoking fast time trial beating me by 45 seconds cutting his time gap to me in half. The rest of the field came in minutes behind us so unless a break got away and lapped me in the field twice, the worst I was going to do in the overall was 6th place. I wasn’t going to give up a shot at the overall podium without a fight, though. My only shot at it was to somehow get into a break without Stephan and Jan. I was first off the line and led the pack through the first few corners waiting for the first attack. It came in the form of just one rider (can’t remember who) so I thought for sure that it wouldn’t stick. Then there was one more rider, and then another rider, and still I was on the front waiting for one of the teams to chase. But before you can say “oh my goodness you missed the boat”, there was a solid break of four with maybe 10-15 second gap over the field. One team missing from the break was Team Coco’s. Frank Travieso corrected that by bridging solo at probably 35mph – given the incredibly short amount of time it took for him to leave our group and bridge the gap up to the leaders 10-15 seconds ahead of us. At this point, I thought not only was the break a done deal, but also that it was going to lap the field within the first 15 minutes of the race. The only thing keeping the break from doing that was a steady effort by UHC/706 who wanted to keep the pace fast enough so that the dreaded “double-lapping” wouldn’t happen causing somebody to leap frog Stephan in the overall. I also think they wanted to keep the pace high to discourage attacks. I attacked as often as I could – maybe four or five times? Each time I was hoping to get one or two strong riders to go with me, but it never happened. I would go off the front, stay off the front solo for 20-30 seconds and then run out of energy, get drawn back into the field by the steady chase of UHC/706, rinse and repeat. I wasn’t the only one attacking, and all of these attacks had a nice effect of ramping the field’s pace up enough to gradually reel the break back in. At one point we were only 10 seconds back from the break. I had just finished an attack, and the pace in the field had started to slow down when Shawn Gravois (Globalbike) launched a perfectly timed attack and was able to finish the bridge to the leaders a couple laps later. The renewed horse power helped drive the break away from us again. With eight laps to go, I gave up attacking and started to position myself for the field sprint. I worked hard to stay at the very front and managed to surf through all the surges entering the last corner in 3rd wheel. But I came out of that corner on the windward side of the two riders in front of me — I’m still not entirely sure what I was thinking — it must have been that I somehow thought I was going to have some miraculous sprint — but I was immediately blown backwards by the wind getting passed by 3 people in the sprint and then an additional 2 people within 5 meters of the finish line to finish 7th in the sprint, 14th in the race. Not a great finish, but I was happy to have raced really hard – especially with all my family there watching and cheering – and to have snagged a top 5 in the stage race classification. Lots of data from the weekend. I was happy to have set a new power record in the road race – confirming that it was indeed a really, really tough race. 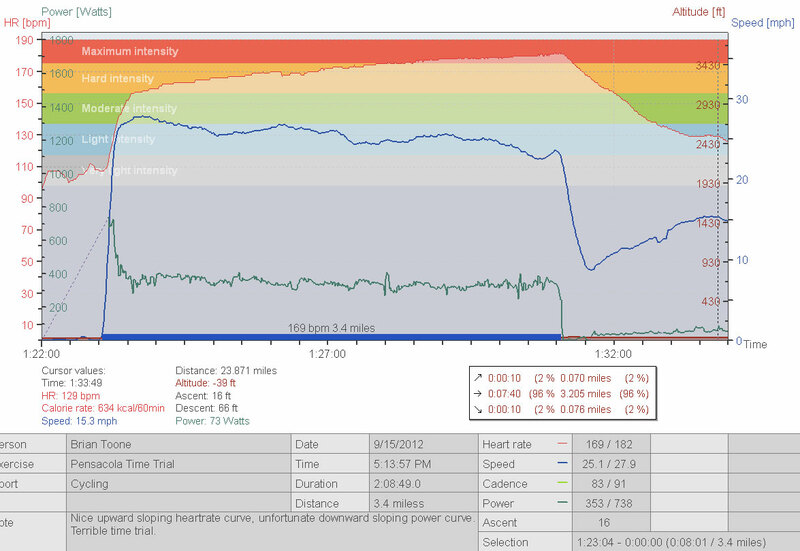 Here is all the power and heartrate data from the weekend in the following order: road race, time trial, criterium. New record amount of time spent in zone 5 in a single race this year. 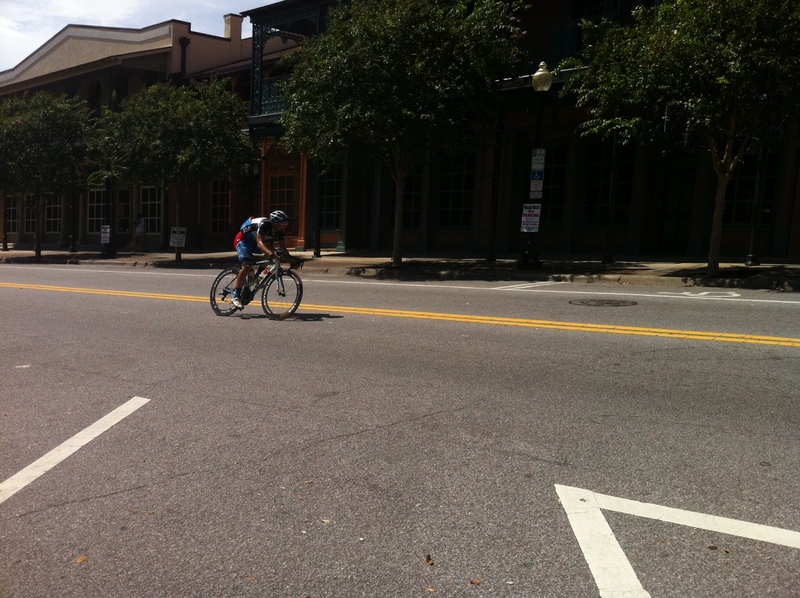 This entry was posted in Racing and tagged criterium, race, stage race on September 17, 2012 by kartoone. Another teammate, Mike Lackey, raced with us and was a strong workhorse all weekend sacrificing his chances at the overall to help cover moves throughout the weekend. Our weekend started out with very high heart rates, but it wasn’t just from the race. On our drive over from Birmingham, we had to dodge several tornadic storms that seemed to be following the interstate. We were driving through Meridian when it was under a tornado warning, and I snapped this picture. We were so focused on this storm that we didn’t see the other tornado that was much more of a threat to us. We made it past this second storm JUST in time. The map below this second photo shows our route (in green) and where these two pictures were approximately taken from. Tornadic storm #2, we didn’t even see this one until we were almost in it! The tornado map and our path (shown in green). We were in downtown Meridian while the tornado sirens were going off. We were VERY lucky, but there were many people — even some on the same interstate as us, that weren’t so lucky. By the time we made it to Brookhaven, the weather had completely cleared out, and the Friday night block party / activities / fun zones / entertainment was just getting under way. I have got to figure out a way to convince Kristine to come down with the kids next year. Plus there were three trains that passed within 50 meters of where we parked. Josiah would love to see those trains going right through the middle of town! 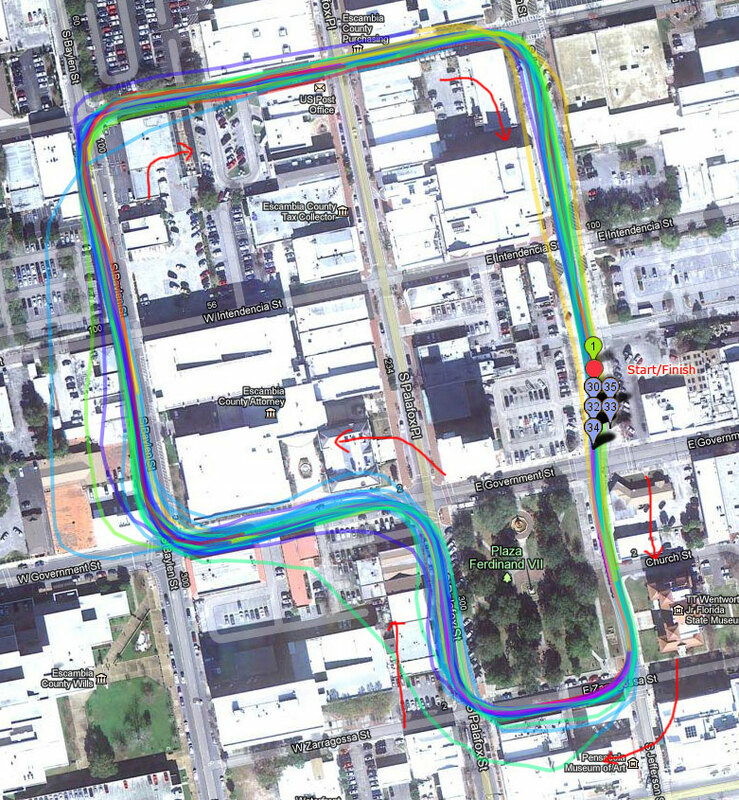 One of the great things about this crit is that the Cat 1/2/3 field is the only field racing on Friday night so you can do your entire warm-up on the course for over an hour on blocked off streets. I was a little slow getting everything together, so I only had about 45 minutes to warm-up, but that was more than enough time to ride nearly 15 miles of warm-up on the course! Almost everyone was warming up on the course so it was great to chat with riders from the other teams during the warm-up. We had four riders representing Tria Cycling. Herring Gas and Marx and Bensdorf had really large teams (about 8 riders each). Team La’Sport had a small but very strong team with the defending champ, Matt Davis, and super-domestique Russ Walker. S3 Racing, Sigma, and Tiger Cycling Foundation all had teams with about 3 or 4 riders each. 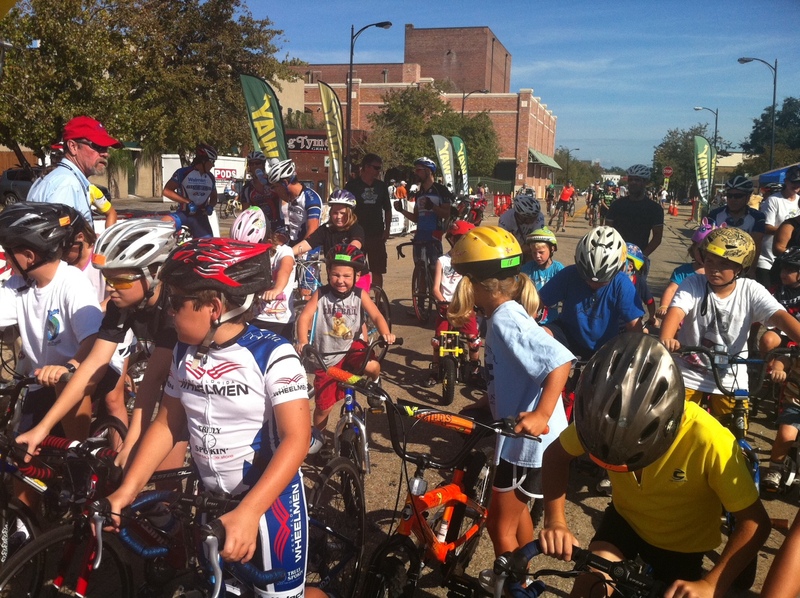 In all, there were 41 people that lined up to start the criterium. After a color guard ceremony by local firefighters including the national anthem that wasn’t quite finished when the third train of the night passed through within 50 meters of the start, we were off! And we were off fast! I clipped in first and made it to the first corner first, but having learned my lesson this year from both Tuscaloosa and Dothan, it is better to let someone else put in the first attack. So I let up a bit and got passed by a few riders before digging in to maintain my position near the front of the pack. On the third lap, I was sitting in maybe 10th position when I saw Matt Davis (Team La’Sport) and a Herring Gas rider (Bain Foote) attacking from near the front going into the only lefthand corner on the classic six corner course (Turn #4). I had to wait just a second for somebody to move out of the way, but once the lane was clear, I shot up the lefthand side between turns 4 and 5 and then latched onto the two-man break before turn #6. We had a couple second gap and absolutely buried it (the average speed for Laps #4 and #5 was 29.5mph). Meanwhile, back in the field, my teammate Pat Allison began covering moves and made it into a two-man chase group. When those two guys ran out of steam, he attacked and finished the bridge solo up to our break. We kept the pace super high, but two more Herring Gas riders (Frank Moak and Tim Reagan) and Bryant Funston (Marx and Bensdorf) and an independent rider were able to bridge up to us bringing our break up to a total of 8 riders. The independent rider fell off after a few laps (probably exhausted from completing the bridge up to us!). The seven of us established a pretty good rhythm and flew through the entire course. One disruption came when they called a $50 prime. I was feeling very good so I attacked going into Turn 3 and was able to hold it all the way to the line to claim the $50. Matt Davis got a gap chasing me, and the two of us tried to get away, but the three riders from Herring Gas were able to pull us back in after a lap. For the next 10 laps, we worked well together. I felt like several riders were struggling so I wanted to attack to see if we could get a secondary break going. Pat gave me a leadout from the back of the group through turn 6 into the start/finish area, but as I came off of Pat’s wheel to attack, my left foot cramped behind my toes. So here I was trying to attack and trying to calm down the cramp at the same time while surprising no one! So even in the moment of all this happening, I chuckled thinking how comical it must have appeared. By this point, our break was getting closer to lapping the field and despite my foiled attack, we continued to rotate and fly through the course. When we got within a corner of the pack, I attacked again to bridge up to the group. I was hoping that in the chaos of lapping the field, that we would have a better shot at winning the race. As soon as we caught the field, I found myself on Pat’s wheel, and he wisely moved all the way through the group to the front. By this point there were only two laps to go. Just as we made it up to the front of the group, we could hear a crash happen in Turn #2 behind us. We were ahead of the crash, so we made it safely through. With one lap to go, Matt Davis’s teammate Russ Walker got to the front and drilled it for the entire lap. This worked out great for us because we didn’t have to fight for position since it was single file and we were lined up right behind Matt, but Russ had done such a fast leadout and Matt launched such a strong kick that none of us could come around anyone so we finished in that order. Bain came up the right side and almost caught me at the line, but I held on for third with a photo finish bike throw. Check out that average speed! 27.4mph. NOTE – this is only 0.1 mph slower than Sunny King, but my average heartrate was 7 beats higher in Sunny King. The reason is because we bunched up so much in turns 3 and 4 in the Sunny King crit, whereas in the breakaway in this race we flew through the entire course without touching the brakes at all! This was a great race for our team with Pat Allison making it into the winning breakaway and securing a position on the overall stage race podium. And I got to rest easy in the pack and save up for the field sprint, which I won by a lot. There isn’t a lot to report about the race, other than that it was windy with a headwind through the start/finish stretch and a tailwind on the backside of the course. There were lots of attacks, but there were also lots of strong riders able to bring back each one. My teammate, Justin Bynum, made it into a great move with Ben Gabardi (Herring Gas) on the third lap. The two of them got a good gap on the field forcing other teams to set tempo at the front to real them back in. The two of them were away for quite a while. By the start of the final lap, we had caught the break, and I realized that there was pretty much no way that both Pat and I were going to be able to make it into a break together. When I saw Matt attack again with Bain right on him, I yelled up to Pat who was in much better position than me to go with it. He did, and I stayed back which meant that both Team La’Sport and Herring Gas were happy to let the break get away from the field. Travis Sherman from Marx and Bensdorf was already up the road and latched onto the break when it came by, so they too, weren’t going to chase. The other teams in the race (S3, Sigma, and TCF) chased and kept the break very close for a while, but eventually the elastic broke and nobody was left to chase. I realized that Travis would be passing me in the overall if the break got too far up the road, so I went to the front and tried to set tempo. Eventually, I realized it was hopeless and that it would be better to go for the field sprint than to try to conserve one spot on GC. So I stopped working and just sat near the front waiting for the field sprint. The field sprint came, and I rode wheels navigating through a tight bunch sprint. The uphill drag though really favored me, and I won it by a lot. Meanwhile, in the break up front, Matt eventually took the sprint win followed closely by Bain, Pat, and Travis in that order. The time trial was the start of the race within a race. Three guys battled for the podium spots (Matt, Pat, and Bain), while Frank, Tim, and I battled for fifth place. Travis had fourth place locked up after the road race. The time trial course was the new three mile course from last year. Since I missed last year, this was my first year to race it, and it was awesome. The course was rolling, fast, and into a headwind. I pushed the pace as hard as I could riding Eddy Mercx style, but ended up sliding behind Frank and Tim in the overall. Pat raced a strong time trial, but slid back to third pace overall after Bain won the time trial with a blistering 6’01” (nearly 30mph). A couple things to note in my heartrate data – I averaged 168bpm for 6’40”, whereas at the Sunny King race, I averaged 181bpm for nearly 90 minutes. Obviously, the fact that we had raced a long road race in the morning would impact my TT heartrate, but there has to be something else too – any suggestions out there?? The best part of the time trial, though, was trying out our new “bib skinsuits”. All three of us in the picture raced this way, whereas Mike was the only one of us who had a real skinsuit and raced that instead. 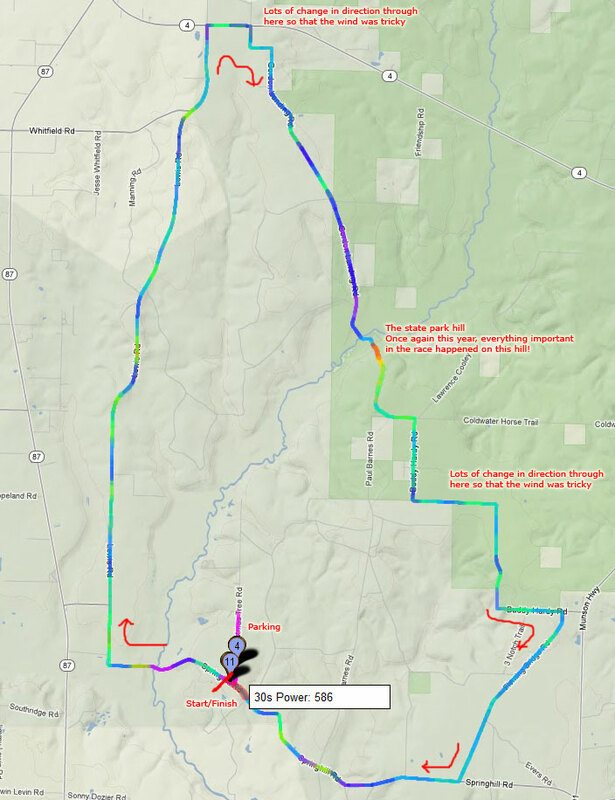 Due to a scheduling conflict at the technical college where the circuit race is normally held, the circuit race was held on a 6.5 mile loop around Lake Lincoln State Park. The course was a great course pretty much constantly rolling with sections of rough pavement and sections of good pavement. The finish was a long gradual drag leading to a steep final 200m uphill kick to the line. At the start of the race, Matt Davis was in lead over Bain Foote by 7 seconds. Pat trailed Bain by 32 seconds. Meanwhile, Frank held the fifth spot 7 seconds ahead of his teammate Tim who himself was 3 seconds ahead of me. With a maximum of 16 seconds of time bonuses available, the time bonuses could help me move up in the GC. It wasn’t to be, though, and with a good uphill finish, Pat and I were able to take 3rd and 4th in the final sprint just behind Ben Gabardi and Matt Davis. The weekend was a great weekend of racing. Pat Allison had his best result ever in a stage race, and we all worked really well together in the team. Check out his excellent recap of the weekend. I’m SO excited for the rest of the season and know that we are going to take home many more wins before the season is done! Happy cycling everyone! Check out my Strava data for all four races, including my lap split times for the crit. Also, the MSGP capped off another 400+ mile week for me this season. I’d like to give a shout-out to Sport Legs and compression socks (aka leg warmers) for helping me with amazing recovery this season. Now it’s time to taper a bit before Athens Twilight – maybe 350 miles this week and then 300 for the week ending with Roswell. This entry was posted in Racing and tagged photos, podium, stage race on April 18, 2011 by kartoone.